no registration required. first come, first served. professionals tracking continuing education can earn 3.5 credits. Click here for a map to the Special Collections Library. Questions about the event? Contact Jitka Dekojova via email. Take a journey into the fascinating world of the beehive and learn what we can all do to hep honeybees in our backyards. 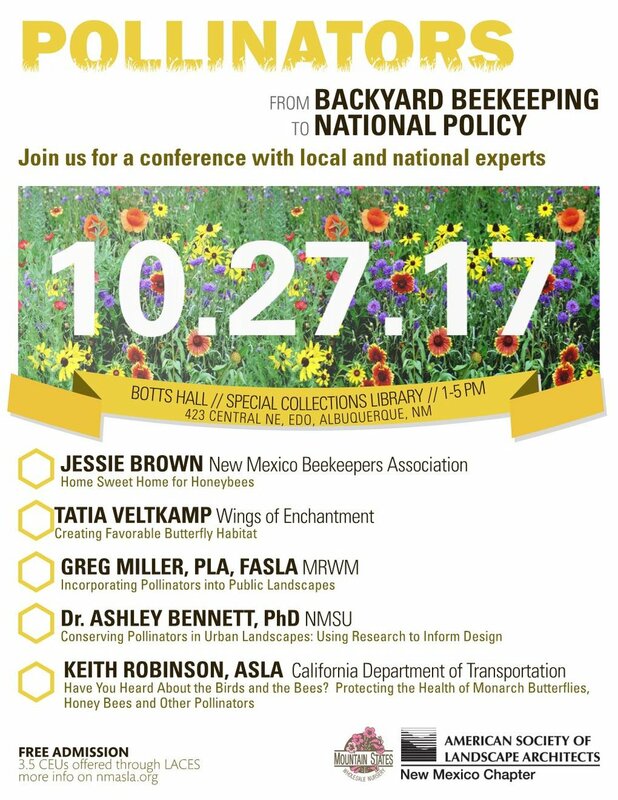 Jesse Brown is the President of the NM Beekeepers Association and has sat on the Board of Directors for the American Beekeeping Federation, Western Apicultural Society and has Chaired the Abq Beeks. She is a backyard beekeeper in Downtown Albuquerque. A refresher about the anatomy and life cycle of the butterfly, followed by a more in-depth look at what specific host and nectar plants to consider for attracting all stages of different native New Mexico butterflies to a place they can call “home”. Tatia Veltkamp has been raising butterflies for over 16 years. She has worked with the Xerces Society on habitat restoration for the monarch butterfly in New Mexico. She has worked with Southwest Monarch Study in Arizona to study the migration patterns of monarch butterflies in the Southwest. She was on the Board of Directors as President for the Association for Butterflies for 5 years. Currently, she is a player in helping to understand the migration patterns of the monarch butterfly in New Mexico. In 2010 she started Wings of Enchantment Butterfly Farm, which brings educational programs on the life cycle of the butterfly to the public and sells butterflies for release at special occasions and butterfly life cycle kits. Public landscapes offer a large range of opportunities to incorporate pollinator plant species and techniques. These landscapes also provide habitat throughout the urban environment. These projects also pose challenges with regard to maintenance, heavy use, harsh growing conditions, and public perception. This presentation will investigate established and emerging strategies for developing parks, streetscapes, trail corridors, and other urban open space to support pollinators. The session will also discuss partnerships between designers, administrators, maintenance departments, and contractors to create policies and standards of practice to ensure the viability of these projects. Gregory Miller, FASLA is a principal landscape architect in the Albuquerque firm MRWM Landscape Architects. His project focus is on parks, schools, streetscapes, and other public landscapes. He has recently worked with the City of Albuquerque Parks and Recreation Department to create design guidelines, standard details and specifications, and a maintenance master plan. He is currently the national President of ASLA. He has taught as an adjunct professor in the University of New Mexico Landscape Architecture program for 12 years. New Mexico is one of the most diverse states in terms of pollinators with over 1,000 species of native bees and over 350 species of butterflies. Unfortunately, pollinators, especially native bees, are in decline. Urban development displaces agricultural and semi-natural landscapes threatening pollinator species. Loss of pollinators, however, does not have to be a consequence of urban development if conservation strategies appropriate for the urban landscape can be identified and incorporated into planning and design strategies. Dr. Bennett will share the results of research that informs the design and management of urban landscapes for pollinators. Research results will cover important urban planning strategies for the landscape scale as well as site design for the local scale. In 2016, Dr. Bennett accepted the urban IPM position at New Mexico State University. Her research and extension program is focused on understanding how local site design and landscape composition affect the ability of beneficial insects to perform ecosystem services such as pest suppression and pollination. Research in the Bennett lab will develop design and management strategies at multiple spatial scales to enhance and conserve beneficial insects in urban and agricultural landscapes. Have You Heard About the Birds and the Bees? Protecting the Health of Monarch Butterflies, Honey Bees and Other Pollinators. Pollinator populations are struggling nationwide. The declining quality and quantity of pollinator habitat contributes to pollinator species mortality that threatens beekeeper viability and agricultural pollination services, as well as other trends in pollinator species critical to agricultural and ecological vitality. This presentation places emphasis on restoring the health of pollinators including the annual Monarch butterfly migration. Our Nation's transportation and other public assets and the people who design and manage them can play a vital role to restore and sustain the health of pollinators. Keith Robinson has over 35 years of leadership in the transportation landscape architectural field. He is a California licensed Landscape Architect (#2299) and Principal Landscape Architect at the California Department of Transportation. Mr. Robinson is responsible for the development and implementation of the Statewide Roadside Design Program and statewide landscape architectural professional development and training.